British Close-Up Magic Champion Based in the West Midlands! Birmingham magician Sean Carpenter is a local entertainer with a national reputation - and the ONLY Birmingham based magician ever to have won the British Close-Up Magic Championships! The amazing close-up magic of Sean Carpenter is available for weddings, parties, and corporate events in Birmingham, Coventry, Sutton Coldfield, Solihull, Wolverhampton and across the West Midlands. Visit our close-up magic page today, to see how West Midlands magician Sean Carpenter can make your Birmingham wedding or awards dinner an event that your gests will remember for years to come. For more information, please visit the TABLE MAGICIAN page, where you can also find quotes from some of Sean's previous clients - or click here to CONTACT Birmingham Magician for Hire Sean Carpenter. Birmingham Wedding Magician Sean Carpenter has amazed and entertained guests at hundreds of weddings across the UK. And if you are getting married in The Midlands, the good news is that Sean is a local entertainer ... so you can hire one of the UK's top wedding magicians without needing a celebrity budget! West Midlands magician Sean carpenter has previously enchanted wedding guests at Himley Hall, Coombe Abbey, Birmingham Botanical Gardens, The Belfry and almost every other top wedding venue in the Midlands. See the WEDDING MAGICIAN page for details and to read quotes from some of Sean's previous wedding clients. West Midlands magician Sean Carpenter has been described by The Stage newspaper as 'outstanding' and is regarded as one of the UK's most entertaining stand-up magicians. The astonishing stand-up magic of Sean Carpenter will leave your guests laughing as well as amazed, and is the perfect choice for the after dinner cabaret at your Birmingham corporate event or West Midlands society dinner. 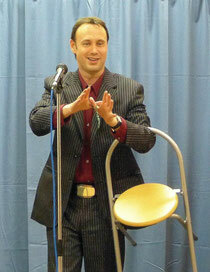 See our STAGE MAGICIAN page for details of how to hire Birmingham comedy magician Sean Carpenter. For a sneak preview, there are live video clips on the HOME and STAGE MAGICIAN pages of this website. Is your company exhibiting at a Trade Show at the NEC, ICC, or any other venue in the West Midlands? 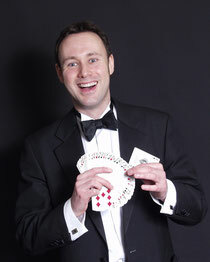 Why not contact Birmingham Trade Show Magician Sean Carpenter to see how he can help. A trade show magician is one of the most effective ways of inreasing footfall to your stand and delivering your sales message in a memorable and entertaining way. Birmingham magician Sean Carpenter is one of the UK's leading trade show magicians, and has helped companies to achieve the best possible results during trade shows at the National Exhibition Centre in Birmingham, the International Convention Centre in Birmingham, the Ricoh Arena in Coventry, and many other leading venues. For more details, visit our TRADE SHOWS page. Sean Carpenter is based in Birmingham, but covers the whole of the UK and is available worldwide.